Stylish dinnerware can not only increase your appetite but they can also make you a popular host. You can serve your dessert in style with a classy cake stand. Making a cake stand at home will help you save some money. Along with this, it will allow you to give your personal touch to the cake stand. Here are some items you will need to make a stylish cake stand. The following steps will help you create chic cake stands which will make your dessert a star! Pick a plastic or acrylic plate. You can go for a lightweight plate. This will help you keep your cake stand more stable. Once you have chosen the suitable plate, you can pick a coordinating cup. You can choose a cup that has no handles. You can go for a white plate and a white cup or a white cup and a black plate. You can also try other color combinations like green and yellow, purple and white or pink and white. Now take a craft adhesive and turn the cup upside down. Put the cup on a flat surface. Now turn the plate upside down and paste it on the bottom of the cup. 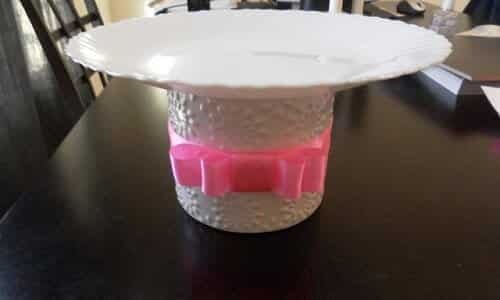 Make sure that the cup is right in the middle of the plate otherwise your cake stand will wobble. Allow your cake stand to dry for a few hours and you are ready to serve your dessert in style. You can decorate your stand with a sleek ribbon. Once you have completed your cake stand, you can gently place your cake on its plate and cover it with an acrylic cake cover. You can use these covers for your cakes, pastries, ice creams and other baked items. There are different types of acrylic cake covers available out there. You can pick an ordinary one or a classy one from The WEBstaurant Store, Crestware or American Metalcraft. You can also pick a nice and clear plastic hinged lid along with a cake cover. You can choose a microwave friendly lid from Cuptainers or Douglas Stephen. These lids and covers will help you cover your dessert while you are traveling or when you are at home.